In addition to evaluating our blog traffic and content, we’ve taken the time to evaluate the effectiveness of our email marketing. Measuring the success of your email marketing campaigns is important to understanding if the strategy you’re currently using is effective. Specifically we wanted to focus on our email open rates and click through rates. Open rate is the percentage of recipients who opened and looked at an email. Here’s more information on the best days for marketing email opens. Click-through rate is the proportion of subscribers who clicked on one or more links within an email. Here’s more information on the best days for marketing email click-throughs. Considering that the marketing emails regarding our blog posts for Major Logo Redesigns of 2013, Why do Hackers Hack? and Untangling Communication With Your Designers each placed in our top 5 best marketing emails in terms of open rate and click through rate, these three emails were truly a success! 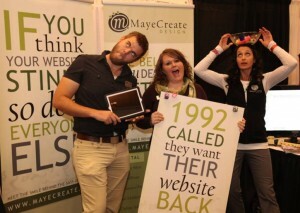 MayeCreate offers clients creative services in web and print design. In 2013, our average email open rate was 19.71% and our average click-through rate was 2.57%. Evaluating our marketing emails for first quarter 2014, our reports showed that we were averaging a 19.33% open rate and a 3.12% click-through rate. According to the MailChip Email Marketing Benchmarks, we are meeting the industry average rates this year. Businesses in the creative services/agency industry average an open rate of 23.65% and a click-through rate of 3.36%. Businesses in the marketing and advertising industry average an open rate of 18.81% and a click-through rate of 2.44%. Our stats fell right in-between those benchmarks. When comparing our email marketing averages, we know that our open rate has decreased ever so slightly from 2013 to 2014. On the other had, our click through rate has slightly increased. These changes can be partly attributed to a shift in our email marketing style. In 2013, we sent out marketing emails in the style of monthly newsletters. Each newsletter contained multiple blog post topics for subscribers to explore. With this style, blog subscribers only received one marketing email per month. For 2014, we switched our method so that each marketing email only includes one blog post topic. As part of our new marketing strategy, we’ve decided to send out marketing emails (focused on a single topic) 3 times per week on Tuesdays, Thursdays and Saturdays in the mornings to our subscribers. So even though we have fairly steady rates meeting the industry averages, we still want to do better and improve our marketing performance. We would like to know how our blog subscribers feel about the changes we’ve made to our email marketing style. By taking a few seconds to answer the questions in the survey below, we will be able to help you receive information how you want it, when you want it, and also help ourselves continue to improve our email marketing performance.